Editor’s note: This piece was put together with archival sources from The Peak which may not be available on our website. Please feel free to browse previous editions of The Peak on our Issuu profile. If we at SFU are being super honest with ourselves, most of us don’t really care about what goes on at our campuses as long as our buses are air-conditioned in the summer and heated in the winter. So when we really do care about something on campus, you know it’s big — a good example being the impeachment of SFSS president Jaskarn Randhawa during the SFSS’s 2018 annual general meeting (AGM), following a series of allegations. Some of the 300-plus students filling the Diamond Family Auditorium for the AGM had waited for over two hours to get in. The meeting’s original start time was 12:30 p.m., but due to a smoke bomb being detonated in the auditorium, the call to order was at 2:56 p.m. Regardless of the impeachment’s repercussions in campus life, as the cliché goes, history tends to repeat itself, and Randhawa isn’t the only one who’s had their journey through SFSS presidency cut short. In October 2006, SFSS president Shawn Hunsdale and six other Board members were impeached during a SFSS Special General Meeting. The impeachment of the so-called “Group of 7” was sparked by their alleged abuse of power within the Board. Hunsdale’s predecessor Clement Apaak stated that the impeached members were responsible for “usurping the power of the board, breaking [their own] by-laws, intimidating other directors opposed to their wishes, ignoring the concerns of students, lying to [students] and hiding behind confidentiality provisions when it [suited] them, disregarding prudent past practices when needed and invoking them when it [suited] them, compromising the private information of students, [and] wasting over $15,000 of [student] fees on lawyers and replacing locks,” among other allegations, including the abrupt removal of seven SFSS staff members. Despite all this, these two presidents are outliers. In the 12 years separating these impeachments, many other SFSS presidents have served the board and the students of SFU. So who were they and what were their legacies? In his candidate response during election, Randhawa expressed that he wanted to continue the board’s long-term projects and increase campus community and social life. He did not have a chance carry out these endeavours. Notable happening: The SFSS’ annual Fall Kickoff concert was not organized this year due to the Board’s inability to negotiate a date with SFU. The Kickoff was replaced with a joint BBQ with UBC’s Alma Mater Society. At the beginning of his term, Kim stressed that he wanted to build students’ trust in the SFSS as well as increase student services and engagement. In his time, he was successful in securing more space for students at the Surrey campus. Going forward, SFU will now prioritize improving the space and providing project-specific and after-hour rooms for Surrey students, according to a press release. However, rocky negotiations with Rotunda student groups over space in the Student Union Building (SUB) may have affected student trust. He also worked with the Board to move away from Meeting, Event, and Conference Services (MECS) so that students could have more choice when it came to what catering service they used. Notable happenings: Kim and the Board made important decisions about the SUB’s space distribution during this term. Rotunda groups such as SFPIRG, radio station CJSF, and Embark were not allotted space in the SUB, although it was allegedly promised. Frustration and space negotiations continue today, most recently with the Rotunda group Students of Caribbean and African Ancestry. When Chen began as interim president in June 2016, she also had to maintain her initial role as vice-president student services. A by-election was held in November and Chen was officially voted into the position of president. She stated that her priority as president was to make strong connections with other board members so they could work effectively as a team. Notable happenings: Chen and the board decided to end SFSS’s Food and Beverage Services (FBS), which included Highland Pub, the Higher Grounds Coffee Shop, and the Ladle. They cited ongoing deficits as their main reason for shutting the services down. Students were frustrated with the abrupt closure and the SFSS’s lack of transparency. The Build SFU stadium project was cancelled in August 2016 after coming out to be three times as much as its original cost. The news angered student athletes, who protested the cancellation at a Board meeting. In March 2017, the stadium was approved (for real) once the project was made more affordable. This January, a final plan with a $15 million price tag was unveiled, meaning that SFU should have a stadium by Summer 2020. Infamous for being asked to step down as president after allegedly not signing up for classes, Sharma had previously been involved with the SFSS in other positions for years. It seems that all his work climbing up through the SFSS was for naught. In his defence, Sharma explained that he thought he had more time to sign up for courses and that his “temporary resignation” became a permanent one because the Board misinterpreted it. Notable happening: He had the shortest term of any SFSS president in the past 12 years. During his election campaign, Weng donned a tiger onesie, brought out his guitar, and hosted a sing-a-long. These charming antics paid off, as Weng went on to become the SFSS president. In an interview peppered with Disney quotes, Weng outlined his goals for the term, such as restructuring the Board and interacting with and engaging SFU students. Notable happenings: Weng proposed to hold a spring concert at the Vancouver Playhouse for SFU students that featured YouTube musicians. The proposal, however, was rejected by the rest of the board on the grounds that it didn’t benefit enough SFU students. In March 2016, however, Weng was successful in uniting the musical clubs of SFU for the Music Showcase Extravaganza. 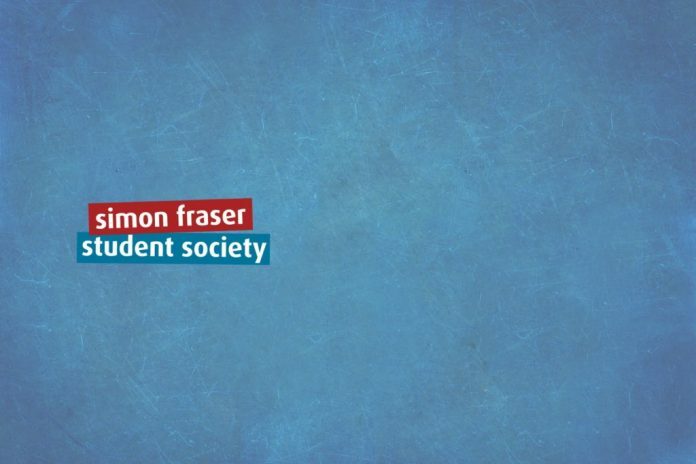 The SFSS also fought to make Surrey campus’ Fraser Library open on Sundays, after many students showed interest in the idea. They were successful. Additionally, they proposed expanding study space at the Harbour Centre campus. Bueckert stressed the importance of returning money to students and making education affordable when she was a presidential candidate. However, there seemed to be some drama when Bueckert was elected. Another presidential candidate, Brandon Chapman, said this when Bueckert won: “You played a very dirty game Chardaye. You didn’t deserve this.” Oh dear. Notable happenings: During the October 2014 AGM, students voted in favour of building both the SUB and the stadium. However, the meeting’s venue quickly filled to maximum capacity, and not everyone who showed was able to cast their votes on the motions. Additionally, two opposing suggestions for a Fall event were brought to the table by Board members — a regular Fall Kickoff and another called the Culture Kickoff Fest. Bueckert was surprised at how late the proposals were coming in, while another board member commented that both proposals “really sucked.” In the end, the Fall Kickoff event was given the green light and it boasted a large turnout. In 2013, Khan was the only presidential candidate running who had executive experience. The other two candidates missed debates and when one was asked who the current SFSS president was, “he pleaded ignorance,” according to a past Peak article. Notable happenings: The SFSS as a work environment was called into question during Khan’s presidency, particularly after former external relations officer Meaghan Wilson came forward after a conflict with the president. She said, “I remember that it got to a point where I asked him if he was threatening me, and he responded, ‘yes.’ (…) I remember sitting and just staring at my desk as he continued talking. I was intimidated.” A few other Board members also came forward about internal harassment. Perhaps it isn’t surprising then that at the AGM that year, a student presented a petition requesting that the SFSS create an official anti-harassment and conflict/complaint resolution policy. Big on changing policies, Yeung led the Board to clearer language in their bylaws. At the end of his term, he stated that he didn’t focus solely on his year of presidency, but on creating a strong foundation that would support the SFSS for years to come. Notable happenings: Concerned about the deficits of the SFSS FBS, Yeung and other Board members hired John Flipse as a new manager to oversee the Ladle, Highland Pub, and Higher Grounds. The SFSS hoped that a clearer line of communication with the manager would be beneficial to the FBS. Notable happenings: The SFSS officially parted ways with the Canadian Federation of Students (CFS) after three years of legal fees and conflict. Student writer Clinton Hallahan explained that the SFSS proposed the split because they were “[o]f the opinion that the CFS had become a bloated, corrupt money-sink.” Students voted 67% in favour of leaving the CFS in 2008. During his time on Board, McCann pitched the idea of creating a student union building, which is (almost) a reality, seven years later. According to student writer Sam Reynolds, McCann was nearly impeached for an SFSS staff lockout (for which coverage is unfortunately spotty). However, the lockout eventually resulted in a collective agreement, and McCann was not impeached. “University is not only about learning. It’s also about the experience that you have,” said Godson to The Peak after heading the SFSS’s first social event of the semester. Unfortunately, the semester’s second event organized by SFSS club I Vision One World proved a failure, as promised headliner K’naan did not perform and not all students could be refunded. What an experience. Notable happenings: After the K’naan fiasco, Godson kept a quiet board. One notable happening would be an article written in September 2010 which boasted that students might be able to ride a gondola to Burnaby campus by 2013. Haha. The SFSS changed a few of their election policies before Nadison was elected, including allowing slates again and eliminating paper ballots in favour of online voting. At the beginning of her campaign, Nadison swore she would keep promises and stay honest throughout her term. Notable happenings: In September 2009, the West Mall Centre Tim Hortons opened, replacing Raven’s Café. These days, SFU is thinking of shutting down the Tims because they don’t provide a Fairtrade option. The SFSS ran an event that placed 75 pumpkins for carving in Convocation Mall and informed students about the government cutting funding for post-secondary education. The event boasted a large poster that said “Cut Pumpkins Not Student Funding!” and the pumpkins were later used to decorate Highland Pub. This one’s a little bit messy and hard to track, to be honest. According to an old Peak article, Paling got married at the Highland Pub (back when it was still open, of course). Yet another Peak article claims that he also “lifted up the shirt of fellow candidate Xenia Menzies to expose her ‘back hair’ in the Highland Pub.” He later apologized in a letter. It seems that this man really had a special connection with that pub. Notable happenings: Near the end of his presidency, the first SFU Burnaby gondola plans were pitched by the group SFU Community Trust and covered by The Peak in a very optimistic article. Paling also introduced an extended undergraduate health and dental plan to students, as well as a board game lending service. Additionally, he gave Highland Pub a glow-up so it looked “less like an airport lounge,” according to Paling. During his term, defederation from the CFS was widely discussed and debated. The SFSS held a student forum that allowed students to debate leaving the CFS. Harder began debate by saying that “the society had ‘outgrown the Federation’” and stressed that the CFS funds, if leaving it were successful, would be redirected to the society. To many, Hunsdale seemed like the ideal presidential candidate. He had years of experience with the Board and Senate, and was passionate about reducing tuition fees. He advocated for better transit service and supported more student grants. However, after only two months as president, seven SFSS staff members were suddenly fired with no explanation to students. From there, things only went downhill for Hunsdale’s presidency. Peak writer Kevin Tilley wrote, “For years, Hunsdale has not-so-secretly had an agenda of returning the SFSS to the CFS’ [sic] control.” Many students were already critical of the CFS at this point, especially grad students who began planning to disconnect from the SFSS (today they are the Graduate Student Society). The president before Hunsdale, Clement Apaak, alleged that Hunsdale’s action of sending staff home was against SFSS bylaws and that he tarnished the reputation of the SFSS and cost it thousands of dollars. In September, students who were unhappy with Hunsdale’s secrecy and actions called for him and other involved Board members to be impeached. On October 25, 2006, over 1,000 students showed up for the Special General Meeting to impeach Hunsdale and six other Board members. 724 students were in favour of the motion, and the members were impeached. However, the directors believed the meeting was invalid, and took the SFSS to court. In December, the court ruled that the meeting was valid. Our student society has left lasting marks on SFU and our experiences as students. Some things we take for granted, like our longer library hours and extended health plan. Others we remember with unforgiving clarity, such as the most recent impeachment. Reading this article may have reinforced or completely changed the way you look at the SFSS, but we must remember that these people are students like us. We, like them, can make great changes in our student government come about. So if you can, take the time to care more about your student government, so it can perhaps take better care of you. Author’s note: If you want to know more about even older SFSS presidents, check out this article.